General Motors Corporation headquarters, Detroit, Michigan. Over the course of nearly a century, General Motors (GM) has weathered more ups and downs and gone through more fundamental changes than most companies. GM has been the world's largest vehicle manufacturer since 1931, producing such brands as Buick, Cadillac, Chevrolet, GMC, Pontiac, Saab, Saturn, and Oldsmobile. From the 1950s into the 1970s, the automaker led the industry in building millions of low-cost cars, achieving nearly 60 percent of U.S. auto sales. Along the way, its Chevy Corvette convertible sports car became an American icon and a symbol of the laid-back West Coast lifestyle. Today, General Motors has about 30 percent of the auto market and faces new challenges, such as decreased productivity, rising costs of employees health benefits, and the demand for cleaner, safer, and more fuel-efficient vehicles. General Motors traces its history back to the late 1800s, when William "Billy" Durant (1861-1947) was leading the horse-drawn carriage market in Flint, Michigan. A natural born salesman with his finger on the pulse of new markets, he realized the future was in the "horseless" carriage. In 1904, Durant took over Flint's failing Buick Motor Company. He quickly turned Buick around, and by 1907, was producing over four thousand cars per year. In 1908, with Durant at the helm, the company was the number-one automaker in the United States, outselling rivals Cadillac and Ford Motor Company (see entry). Spurred by his success, Durant set out to take control of the auto industry. He attempted to buy Ford Motor Company in 1907, but was unable to obtain a $9.5 million bank loan. Instead, he formed the General Motors Company, with headquarters in Detroit, Michigan, and began adding other new divisions. In 1908, Durant purchased Olds Motor Works, which had been formed in 1899 by Ransom E. Olds (1864-1950). In 1909, he acquired the Oakland Motor Car Company, which eventually became the Pontiac division in 1932. Rapid Motor Vehicle Company, the predecessor of the GMC truck, was purchased soon after. By 1910, Durant had gobbled up so many companies that GM was deeply in debt and on the verge of financial collapse. Several banks stepped in with loans to help out the struggling automaker on the condition that founder Durant be replaced as company head. After losing control of GM, Durant started the Chevrolet Motor Company in 1911. Subsidiaries: Adam Opel AG; Allison Transmission Division; Covisint, Inc.; Daewoo Motor Company Ltd.; General Motors Acceptance Corporation; GMAC Insurance; GM Locomotive Group; Hughes Electronic Company; Isuzu Motors Ltd.; New United Motor Manufacturing, Inc.; OnStar Corporation; Saab Automobile AB; Saturn Corporation; Vauxhall Motors Ltd. The General Motors board of directors elected Pierre S. du Pont (1870-1954) its chairman in 1915, a position he retained for nearly fourteen years. Durant, however, remained on the board and embarked on a GM stock-buying spree. By 1916, he had purchased 54.5 percent of GM stock and with a controlling interest, took over as president of GM, ousting Charles W. Nash (1864-1948) who had served in that role since 1912. Power shifted again in 1918, when General Motors took over Chevrolet. Olds Motor Vehicle Company is started by Ransom E. Olds. David B. Buick founds the Buick Motor Company. General Motors Corporation is formed, incorporating Buick and Olds. CM purchases Cadillac Automobile Company. GM buys the Chevrolet Motor Company. GM opens its first European assembly plant in Copenhagen, Denmark. Workers at two Michigan assembly plants stage a sit-down strike. Workers' strike is settled when GM recognizes the United Auto Workers (UAW) union. All GM plants convert to producing military supplies until the end of World War II. GM introduces the Chevy Corvette. Ralph Nader publishes the book, Unsafe at Any Speed, critical of GM and its Corvair. GM-made guidance and navigation systems are used in Apollo 11 Moon landing; Corvair is discontinued. GM acquires Hughes Aircraft Company. GM announces plans to close eleven U.S. plants. The Saturn line of cars is introduced. GM chairman Robert Stempel resigns amid financial crisis. Assembly plant is opened in Shanghai, China. GM announces it will discontinue its Oldsmobile line. Company announces that eighty-seven new models will be introduced over the next four years. General Motors expanded into Canada in 1918, merging the McLaughlin Motor Car Company Ltd. and Chevrolet Motor Company of Canada Ltd. into General Motors of Canada Ltd. It also made an attempt to get into aircraft manufacturing when it purchased the Dayton Wright Company in 1919. Ten years later, it sold the company to Fokker Aircraft Corporation. A more successful acquisition that year was of the Guardian Frigerator Company, which was renamed Frigidaire Corporation. It soon became the best-selling refrigerator in the country. The 1920s and 1930s saw General Motors continue to expand by purchasing smaller companies and moving into foreign markets. It opened its first European assembly plant in Copenhagen, Denmark, in 1923. The first GM vehicle assembled outside the United States and Canada, a Chevrolet utility truck, rolled off the assembly line on January 7, 1924. Manufacturing plants were also opened in Buenos Aires, Argentina, in 1925, followed by plants in Australia and New Zealand in 1926. GM's acquisitions included Vauxhall Motors Ltd. of England, Fisher Body Company of Detroit, and Adam Opel AG of Germany. In 1923, Alfred P. Sloan Jr. (1875-1966) became president of the ever-expanding GM. His priority was to make sure all the various divisions of the company were functioning efficiently. As part of this vision, Sloan structured General Motors so that its many parts worked together to produce maximum profits. At the same time, he wanted each of the divisions to retain its own unique identity. This was no easy task since GM produced a wide range of products, including Cadillac limousines, earthmoving equipment, buses, refrigerators, spark plugs, and roller bearings. For much of Sloan's long tenure, which lasted from 1923 until 1956, General Motors was the largest and most profitable manufacturing company in the world. In 1936, amid the harsh economic climate of the Great Depression, employees at two GM plants in Flint staged sit-down strikes. Like many workers across the United States, they demanded higher wages, more benefits, and the right to be represented by a union. The strikes ended after about six weeks when GM recognized the United Auto Workers (UAW) union. Through the union, autoworkers could negotiate with their employees for improved working conditions, wages, work hours, and benefits. On January 11, 1940, General Motors produced its twenty-five millionth vehicle but entered the decade under the dark cloud of World War II (1939-45). GM Japan ceased operation in 1941, the year the Japanese bombed Pearl Harbor. In 1942, GM converted all production at its assembly plants to the war effort, churning out $12.3 billion worth of goods, including airplanes, airplane engines and parts, trucks, tanks, guns, and ammunition shells. Vehicles included the 6x6 Army truck that carried troops and supplies and the DUKW, known as "the duck," which could carry fifty troops on land or water. With the war over, GM again turned to producing cars, bringing out several dozen new models in the 1950s and 1960s. An American legend was born in 1953 when GM introduced the Chevrolet Corvette, the first mass-produced sports car and the first with a plastic body. The company introduced new, smaller models during the 1960s, including the Buick Special, Oldsmobile F-85, Chevy II, and Pontiac Tempest. The decade also found GM embroiled in several battles with the federal government. In 1961, the U.S. Department of Justice accused the company of using unfair practices to try and control all aspects of the diesel electric locomotive market. A federal judge dismissed the charge three years later. In 1962, the Justice Department filed charges against GM and three Chevrolet dealer trade associations. It accused GM of restricting Chevrolet sales in Southern California by refusing to sell to " discount houses," which are independent car dealers that buy vehicles in bulk and resell them to the public, usually at lower prices. A federal court ruled against GM in 1966, ordering it to stop restricting sales of Chevrolets to discount houses. The company's image was further tarnished in 1965 with the release of Unsafe at Any Speed, a landmark book written by consumer advocate Ralph Nader (1934-). In his book, Nader was highly critical of GM and its Corvair model, which resulted in a publicized ongoing disagreement between the advocate and the automaker. In 1966, Nader accused GM of harassment, and the U.S. Senate committee investigated the situation. Company president James M. Roche acknowledged the harassment and apologized to Nader on behalf of GM. In 1969, GM's Chevrolet division announced it was discontinuing Corvair production. In the mid-1950s, the Volkswagen Beetle was a big hit in the United States and GM's Chevrolet division decided it needed a car to compete with it. Chevy designers were told to come up with a car that was small, got good gas mileage, was easy to manufacture, and had a European look. The result was the Corvair, which debuted in 1960, and was available as either a two-door coupe or a four-door sedan. In appearance, it was not at all like the Beetle. It had a boxy shape compared to the VW's half dome look. It also had more interior room. It did, however, incorporate many of the basic components of the Beetle, including an engine located in the rear of the vehicle. By 1965, more than 1.2 million Corvairs had been sold when the car ran head-on into a wall of bad publicity. That year, the book Unsafe at Any Speed by consumer advocate Ralph Nader (1934-), was published. It claimed the Corvair would sometimes malfunction, causing the car to go out of control and roll over. GM denied there was a safety problem and in 1972, the National Highway Safety Administration investigated the situation and found that the Corvair was safe. The ruling, however, came too late. In 1965, Chevrolet produced 237,000 Corvairs; that number dropped to 103,000 in 1966. In 1969, the last year the car was built, only 6,000 Corvairs came down the assembly line. Over one million snazzy Corvairs were produced between 1960 and 1969; an estimated 300,000 Corvairs were still in use in 2002. The 1970s brought a whole new set of problems. With the start of the environmental movement, public pressure was placed on the U.S. government to reduce air pollution. As a result, federal laws were created that required Detroit to build "cleaner" cars. In 1971, GM introduced engines that ran on unleaded or low-leaded gasoline, which burned cleaner than fully leaded gasoline. Prior to that time, all cars ran on leaded gas. In order to comply with the Federal Clean Air Act, GM began installing catalytic converters on all its cars sold in the United States and Canada, beginning with 1975 models. Catalytic converters help clean harmful exhaust fumes emitted by cars. It also began to build smaller cars that used fuel more efficiently, a trend that continued through the 1980s. That trend was reversed in the 1990s with the rise in popularity of bigger vehicles, particularly minivans and sport utility vehicles (SUVs). By the start of 1980, the United States economy was in trouble. As a result, auto sales plummeted and carmakers suffered. GM posted an annual financial loss that year, its first since 1920. The loss came at a time when the company was spending billions of dollars to modernize aging assembly plants in the United States and abroad. Its finances were also weakened by a string of acquisitions made during the decade, including Hughes Aircraft Company, a defense electronics firm, and Electronic Data Systems, a data processing and telecommunications company. These factors led GM to close eleven plants worldwide, including several much publicized closings in Flint, Michigan, the city where the company began. All told, thirty thousand jobs were eliminated. The cost-cutting moves seemed to have paid off when in 1988, GM reported a $4.9 billion profit on record sales of $110.2 billion. The sweeping and painful cuts were put in place by GM head Roger B. Smith (1925-), the longest-running CEO since Sloan. Smith was a colorful but controversial person who added an interesting chapter to the history of GM. Named CEO in 1981, he became known for his extraordinary vision and business savvy. He was also considered to be a blunt, quick-tempered loner. Smith expanded GM's overseas operations and improved the quality of GM cars. He served as CEO until he retired in 1990. The 1990s, like the 1980s, was a decade of turmoil for General Motors. As revenues once again dropped, GM chairman Robert Stempel (1933-) announced he would close twenty-one North American production plants and eliminate seventy-four thousand jobs over four years as a cost-cutting measure. But the cuts failed to impress GM's board of directors, which demanded and received Stempel's resignation, giving the job of CEO, and the daunting task of rebuilding the company, to John F. "Jack" Smith Jr. The bright spot of the decade for GM was the introduction of the Saturn line of autos, built in Tennessee. The Saturn was designed to compete against small import cars, which it did with great success. Part of the success was due to Saturn dealerships not employing high-pressure sales techniques and its excellent customer service. After twenty years of declining market share, General Motors started the twenty-first century with a shakeup of its top management. Its board of directors named G. Richard Wagoner Jr. as its CEO in 2000, replacing Smith, who remained as chairman of the board. Some industry analysts suggested GM would have been better off hiring a more dynamic leader from outside the company. 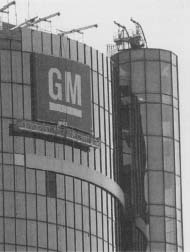 According to Irene Gashurov writing for Fortune magazine in 2000, "Despite constant reorganization over the past decade, [GM] remains complex, bureaucratic, and highly politicized. The question is not so much, Can Rick Wagoner run GM? He can. The questions are these: Can Rick Wagoner make GM hum? Can he turn it once more into the heartbeat of America? Can any insider?" The closing of GM plants in Flint, Michigan, led to the 1989 controversial movie Roger & Me by Michael Moore (1964-), a novice filmmaker and son of a Flint GM worker. The film features Moore relentlessly pursuing Roger B. Smith (1925-), CEO and chairman of General Motors, to try and get him to visit Flint, which was devastated by the shutdown of the GM factories. Funny in parts and deeply moving in others, the movie tells the story of a working-class city in the Midwest that depended on the auto industry. Two years later, those questions were at least initially answered. By 2001, after several decades of decline, GM controlled 30.9 percent of the U.S. auto market, up slightly over 2000. That same year, the company reported a profit of $1.5 billion on global sales of $177.3 billion. Some of the biggest news came in 2002 when, for the first time in eleven years, Chevrolet vehicles outsold Ford. Some industry analysts credited the upswing to improved vehicle quality, increased worker productivity, and getting rid of unprofitable vehicles. GM also unveiled plans for introducing more models than ever before, with eighty-seven new car models to roll out between 2002 and 2006. The success of GM will likely hinge on how popular these new models become. I would not call Michael Moore a novice filmmaker. I thought the film was very one-sided and did not present ALL the facts. The timeline mentions 1956 as the introduction date of the Corvair; it was actually introduced in late 1959 as a 1960 model. The article also states that it was originally introduced as a coupe and four-door sedan; it was initially introduced as a four-door sedan, with the coupe added to the model range late in the 1960 model year. The timeline mentions the Corvette's introduction in 1953, but fails to mention some much more significant achievements of GM: the self starter, first introduced in the 1911 Cadillac; the first automatic transmission introduced in 1939 for the 1940 Oldsmobile; and the first high-compression V8 engines, in the 1948 Oldsmobile and Cadillac.